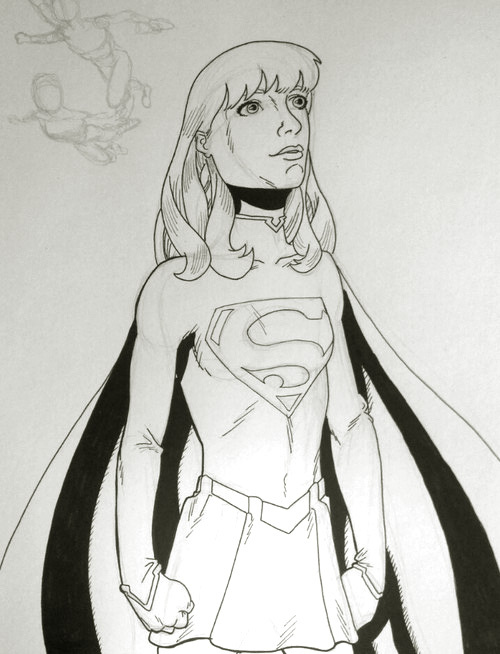 If you linger online and keep your ear to the pop culture grapevine, you might have heard about a Kickstarter project based on Superman Lives. In the late '90s Tim Burton and Kevin Smith were brought together to make a new Superman movie, and it was infamous for its casting choice: Nic Cage. This was obviously years before Bryan Singer's Superman Returns and this year's Man of Steel. Throw your mind back to 1997. I was a member of Kevin Smith's online community. Smith had made Clerks and Mallrats and had just made Chasing Amy. I was not a prominent figure, just one of the thousands on the View Askew message board. But I was fascinated with Smith's Superman Lives script. As a burgeoning comic wannabe, I thought I could whip myself into shape by adapting the script into a serial of scene highlights. A web comic, you could call it. If you wanted. It would give me a schedule to follow and a public forum to live up to. For all of 1998, my serial, called Project Pocketwatch (after my VA screen name), regularly offered new scene moments based on Smith's casting ideas and my feeble, woeful drawing efforts. Here's some of the roughly 40 images I made for the project. Man, is Nic Cage hard to draw. I have a workshop. 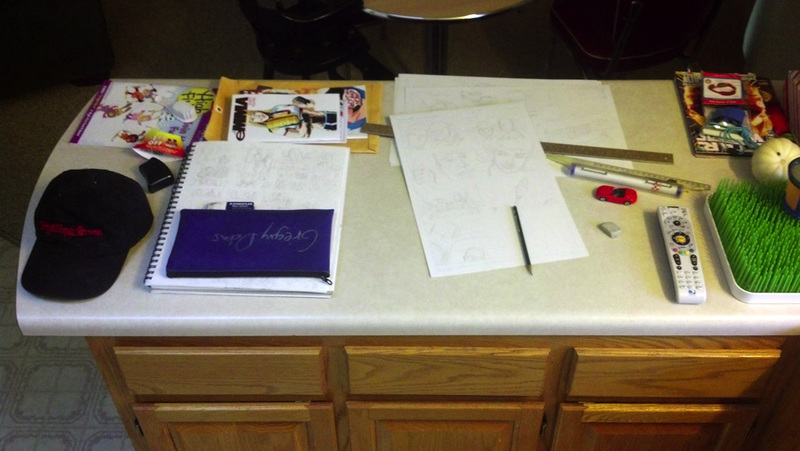 I have a drawing table. But I also have a toddler. So I haven't seen the first two items in a while. Instead I draw in the house proper where I can watch over the deputy. Here's my kitchen workplace. The hat is for art reference. I won it from RollingStone.com in a name-the-band cover contest. The red car is also for reference. At this counter, I can see the deputy watch cartoons for hours on end. Makes for an un-fun work soundtrack, but I don't have the usual temptation to watch the TV while working. The deputy was sick for a few days, so I got some work done. This is a week's worth of pages. 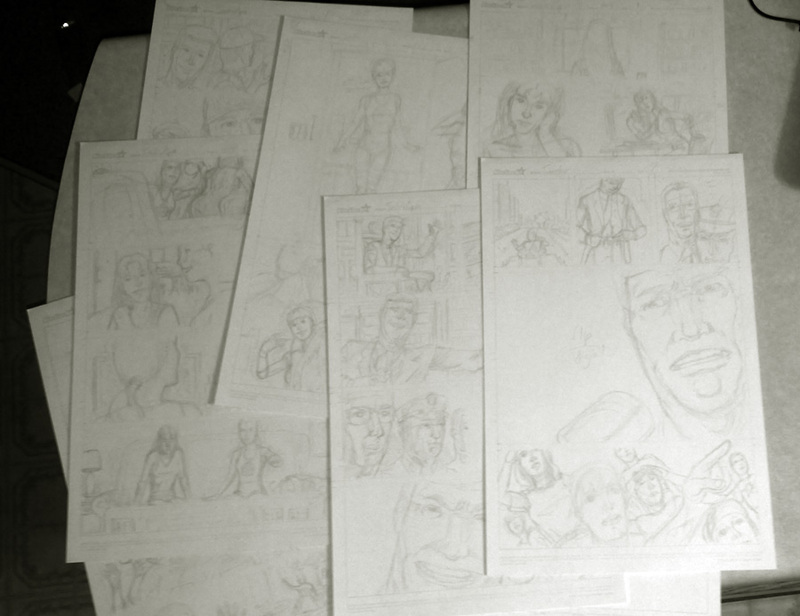 Seven pages isn't bad, especially when one panel took upwards of five hours from perspective grid to finished pencils. These pages feature a lot of blah-blah, setting up the following 20+ pages of rootin'-tootin' action. This is the Big Bad monologuing. And this is when the good people of our fair city realize something bad's coming their way. 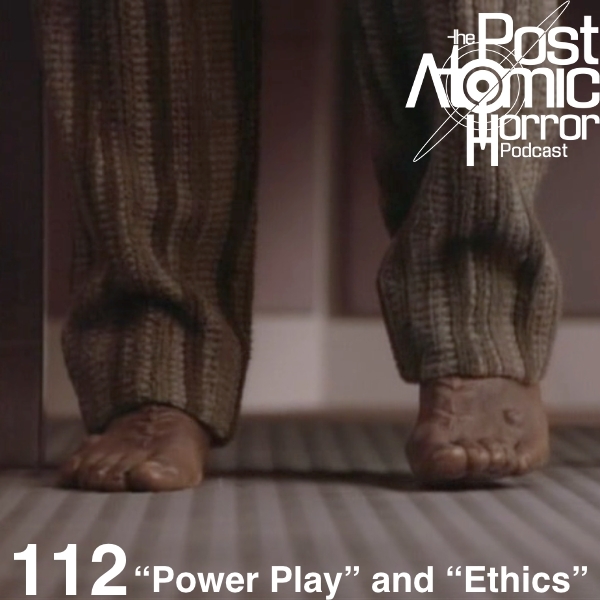 I sat in on the Post Atomic Horror, a comprehensive review podcast of all Star Trek TV episodes, on Saturday. Hosts Ron and Matt are now onto season five of Next Generation. The two episodes I spoke about are ones I hadn't seen much of. I do remember at least one of them ("Ethics") when it originally aired. TNG was a big deal in my high-school circles, and we watched them religiously. But by the time season five rolled around, I was in college and couldn't watch the show as often. The podcast is online now. It was great fun to do, and I signed up for another podcast in April. 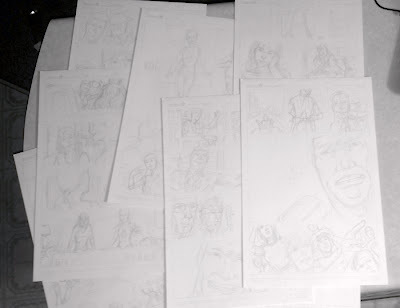 I just finished the thumbnails for the 2013 comic to debut at HeroesCon in June. It came out to 24 pages much to my surprise/delight/giddy relief. Proportional page template, script, 2h pencil, and eraser in my giant sketchbook. Here's my thumbnailing set-up. I have my typed script grouped in loose panel breakdowns but not in page increments. I play with page grouping, and my only concern here is the page count. I try to keep each page's eye-motion moving in the traditional Z pattern, but I break that for dramatic purposes. 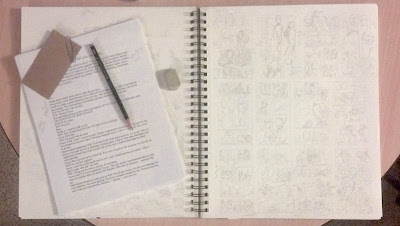 Each sketchbook page holds 12 thumbnail pages with just enough room for script notes in the margins. I was at page 14, thinking I was gonna have to cut scenes, but I drastically changed the big hero moment for Focus, my lead heroine in the Sinclair city hero group.This meant I pretty much chucked the script after that page, but I did meander back to where I wanted to go, and I arrived at a dandy last page that hit me out of the blue. I intend to group this comic and the previous four Sinclair comics into a trade to get it into bookstores, and I aimed this story toward a good conclusion. I also wanted to try some panel tricks and camera angles I couldn't pull off before. If I never make another Sinclair comic (or any comic period), I can look upon this with pride. I'll let this sit for a day and check it again with fresh eyes and adjust the comic if need be. Otherwise, I move onto the full-size pages. I even have a cover idea, and that never happens this soon in the process. Beans and rice. 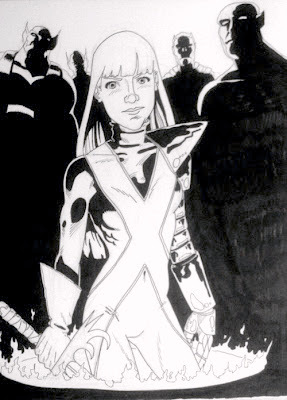 Because of a freelance project, I'm behind in starting the 2013 comic, intended to debut at HeroesCon in June. That gives me right at five months to get this written, penciled, inked, laid out, lettered, covered, and printed. Oy. But this will not be as big a comic as last year's Battle Royal, which was a stupidly huge 40+ pages. No, this comic will be smaller and tighter. I envision it as the last chapter of a trade, a five-issue hero arc. If I never make another comic, this will be a fine place to stop. The script is done as of today, and I am going to sketch out my thumbnails. I already have the script story-boarded in my head for camera placement, but the thumbnails will tell me how well the panels work together. And that brings me to the most important tool of this stage of comic craft. 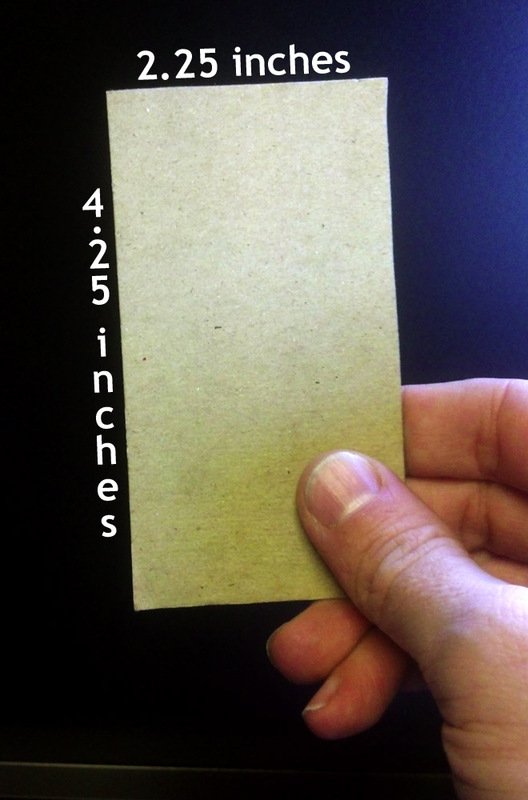 This is my page template. I used the same template for both 2012 comics, and it works great. 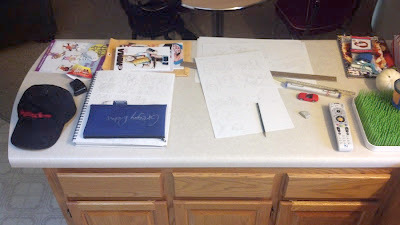 I trace the template outline and sketch my comic inside the reduced, proportionate page dimensions. Hopefully the comic will be thumbnailed by the beginning of next week. 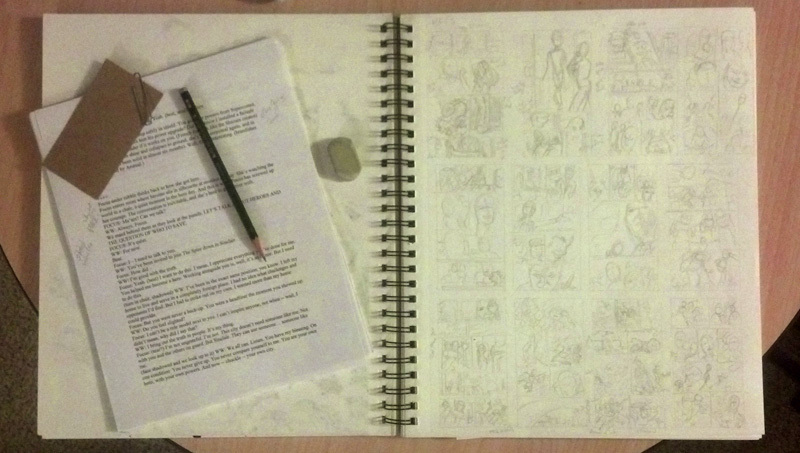 I'll let it sit for a day and look at the pages with a fresh eye before starting the full-size pencils. 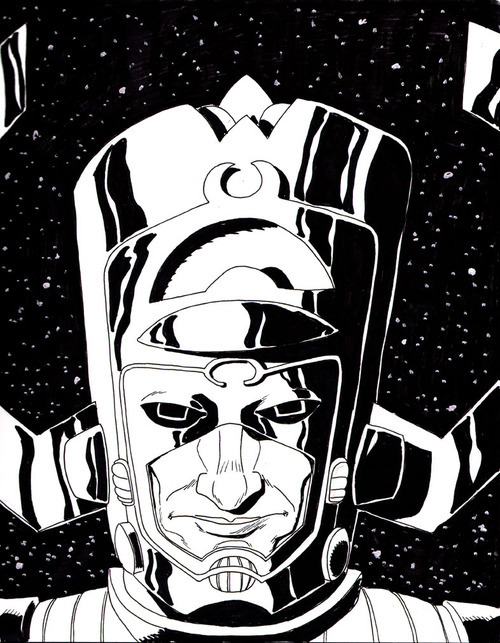 As the Lee/Kirby character rejoins the Fantastic Four comic, I was inspired to work up a drawing. I cannot draw hair, and that's somewhat important for a character whose power is hair-based. I'm hoping to do a drawing every day of 2013. It already sounds exhausting. A quicky pencil drawing made somewhat palatable with clean inking. Done in one afternoon as my son watched some Thomas the Tank Engine. 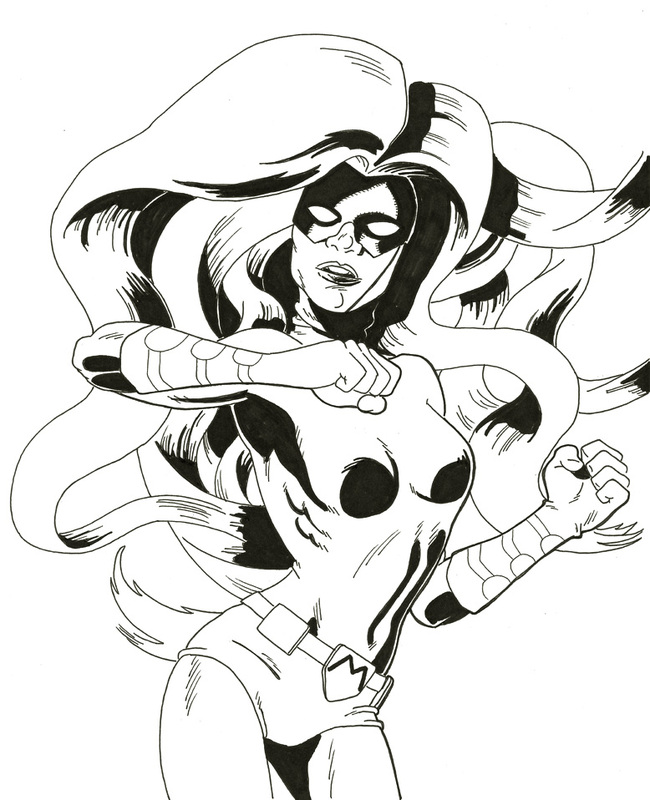 I might sell prints of this at HeroesCon '13. This just in: I'll be at HeroesCon '13. 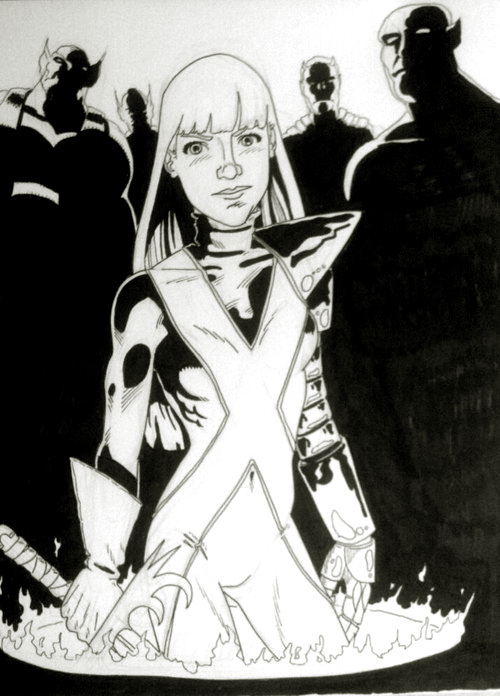 Yet another Illyana drawing. The last one was back in July. This one is more better.